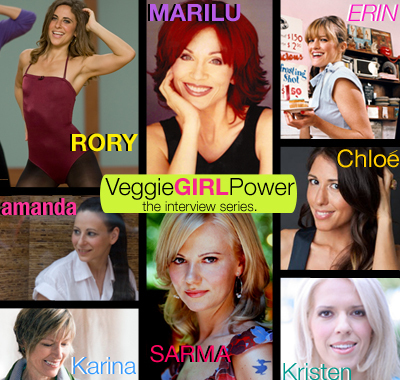 Erin McKenna's Veggie Girl Power Interview! Erin McKenna is the innovative mastermind behind New York City's beloved lower east side bakery, BabyCakes NYC. BabyCakes is certified Kosher, parve and vegan. If someone you love is plagued by food allergies or dietary restrictions, and you think no one cares, BabyCakes cares! Erin has built her business around caring. 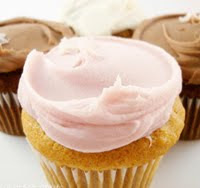 Erin's signature pastel pink vanilla and creamy chocolate frosted cupcakes (and a plethora of other bakery treats) are craved by BabyCakes' many loyal fans. Even food-restriction-free folks flock to this foodie destination. 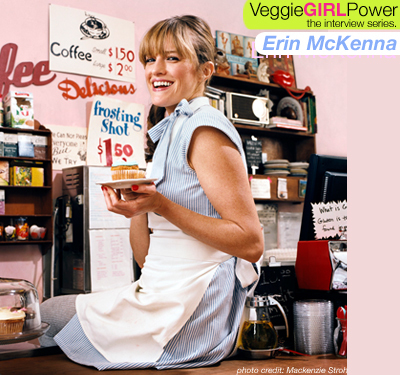 Erin's trailblazing-spirit makes her an inspiring "Veggie Girl Power" role model. BabyCakes NYC: Vegan Heaven. If you are a frequent reader of my blog, you know my obsession with BabyCakes. It's one of my favorite not-so-guilty pleasures. Not only because it smells like sweet french vanilla and sugarplums the moment you step in the door, and not only because the workers wear those adorably-fun pink and white striped uniforms and not only because it has the best vegan doughnuts, tea cakes, biscuits and cupcakes ever...I love BabyCakes for that extra something special. The super helpful friendly staff, the verbal reminder you receive when you order something that contains spelt, and oh yeah, the fact that any BabyCakes regulars will often see Erin herself, uniform-on, hands-on working in her bakery, that's pretty gosh darn wonderful. Trailblazer for Food Allergies and Special Diets. Bravo to Erin for dedicating herself to her BabyCakes vision and succeeding. Though it may now seem almost trendy to be food-allergy-aware, it wasn't too long ago when labels like nut-free, dairy-free, casein-free, white-sugar free and egg-free were rare finds. BabyCakes treats are healthier, allergy-aware, higher quality versions of beloved bakery classics. 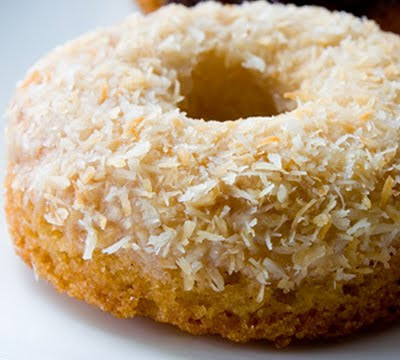 No matter what you crave: biscuits, doughnuts, cinnamon "Skinny Buns", brownies, cookies, cupcakes, muffins or tea cakes. BabyCakes has your treat. I recommend a cinnamon toastie and of course...a cupcake. Pink frosting for me. Loyal BabyCakes Fan. Yes, I am a fan. I own Erin's book, a BabyCakes mug and a BabyCakes tee. I'd stop in for a teat every day if my schedule allowed. And I even placed a BabyCakes cupcake on my blog post: Vegan's Hundred, Foods you must try list. Erin: 1 white grapefruit and a cup of yerba mate. Erin: I saw a need for a place like BabyCakes NYC where those who couldn't go to "normal" bakeries could d be treated to everything they were missing out on. Erin: My favorite restaurant in the city is Minetta Tavern and Vinegar Hill in Brooklyn. Erin: I like just simple pressed apples with cucumber, lemon, and cayenne pepper. Erin: My favorite thing ever is Veganaise by Follow Your Heart. It makes everything taste better! Erin: You get what you give. Erin: I think the chocolate chip cookies are closest to my heart. Erin: If you feel it in your heart, you must go for what is tugging at you. Erin: Emily Woesthoff. She is BabyCakes NYC's General Manager and a strong vegan who spreads the gospel by example in such a sweet peaceful way. She is such a shining example and inspiration. Erin: I don't respond. I knew going into this that there would be haters. You can't please everyone, which is why I do things from the heart and know that at least I will be happy. BabyCakes Bright Spotlight. Erin has appeared on most every media outlet you can imagine. By my fave is when she appears on the Martha Stewart Show and shows Martha how allergy-sensitive baking is done. Martha always seems to adore and approve of Erin's perfectionistic nature when it comes to her recipes. 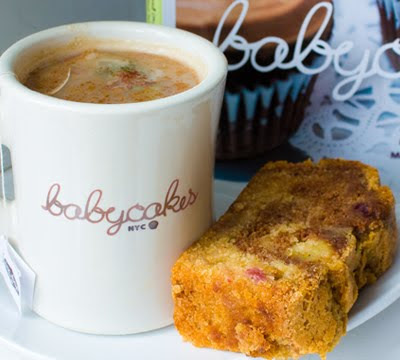 BabyCakes has also been featured in Gwyneth Paltrow's GOOP newsletter, VegNews, the Rachel Ray Show, Lucky Magazine, Vanity Fair, In Style, Nylon, on Food Network, on the cover of Inc Magazine and even on Oprah's 'Best List'! Just to name a few... Needless to say, celebrities and everyday folks can't get enough of Erin's cravable creation known as BabyCakes. Hey Los Angeles, BabyCakes second location will be opening in downtown LA "very soon"...get excited!